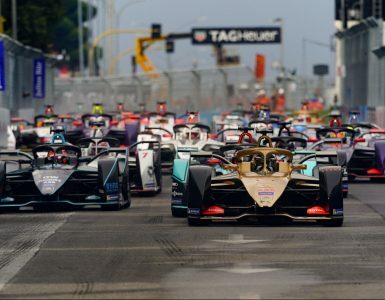 Jean-Eric Vergne produced a championship-winning drive from the back of the grid to beat Sam Bird to the Formula E title after a dramatic opening race in New York. The drivers’ championship, that the resilient Bird had battled so hard to take to the wire against all the odds, was decided after a gripping race 1 on Saturday. 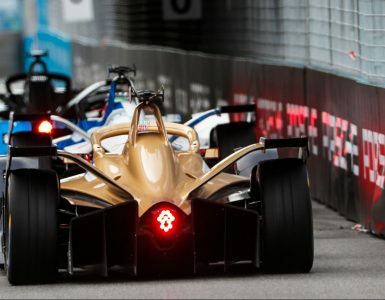 It was due to the excellent race craft and temperament of Vergne that he was able to seal the title and sleep easy before Sunday’s finale after finishing in fifth to Bird’s ninth, thus securing the points margin he required. 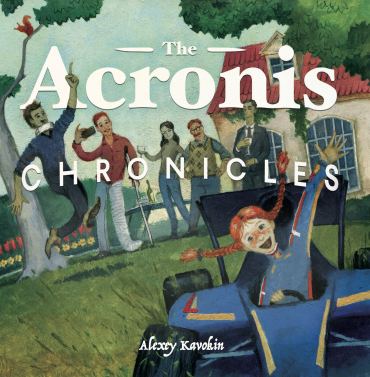 For the record, Lucas di Grassi led home Daniel Abt in an ill-tempered battle for an Audi 1-2, the excellent Sebastien Buemi also on the podium for Acronis’ partner Renault e.dams team. 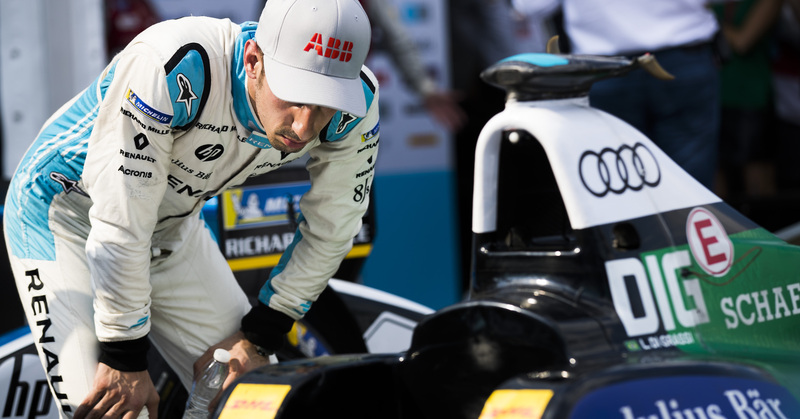 Sèbastien Buemi of Renault e.Dams checks out the car of Lucas Di Grassi from Audi Sport. © ABB Formula E.
Aside from the important matter of the team championship, it was all about the Vergne vs. Bird battle in the opening race. And for a while, it seemed like the Frenchman may be having nightmares instead of sweet dreams after a horror qualifying saw him relegated to the back of the grid after going over his power allocation. But he was a man on a mission, forging his way through the field and up to the sixth place needed for the title after Nelson Piquet’s Jaguar ground to a halt on lap 23. 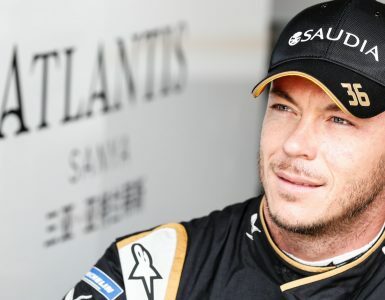 And with team orders in full effect, Lotterer helped Vergne further his cause by pulling over and letting him take fifth as Bird battled to ninth behind from his starting position of 14th on the grid. Vergne was to get his wish as France went on to beat Croatia 4-2 in Moscow to complete a motorsport and football double. Team harmony didn’t seem to apply for Audi on Saturday, much to the despair of team boss Allan McNish, di Grassi and Abt furiously contesting the lead even with the team title at stake, almost taking one another out of the race. And there was one last piece of drama to unfold as Alex Lynn lost control of his DS Virgin Racing car, ploughing backward into the barrier to bring out a safety car with ten laps remaining, giving teammate Bird one last wing and a prayer. He needed to make up two places as the race came down to the final two minutes and contact between Maro Engel and Nico Prost almost gifted Bird what he needed to take the championship to a dramatic finale. A late pass on Prost took him to ninth and within a place of taking it to Sunday. But it wasn’t to be for the gallant Englishman. There is still much to play for before Sunday’s finale as Techeetah and Audi Sport battle it out for the team title. Top image: Daniel Abt and Di Grassi of Audi Sport, Sebastien Buemi of Renault e.Dams, celebrate on the podium after the race.